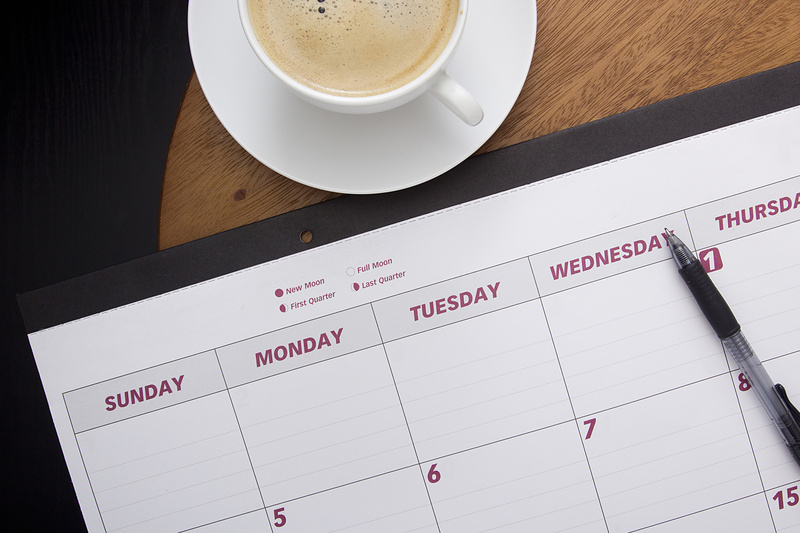 In this article, you’ll learn how to work with the Google Calendar API in PHP. You’ll do it by building a calendar app that allows users to add new calendars, add events, and sync calendars to Google Calendar. If you want to follow along, I recommend you to set up Homestead so you can easily get an environment for running the app. 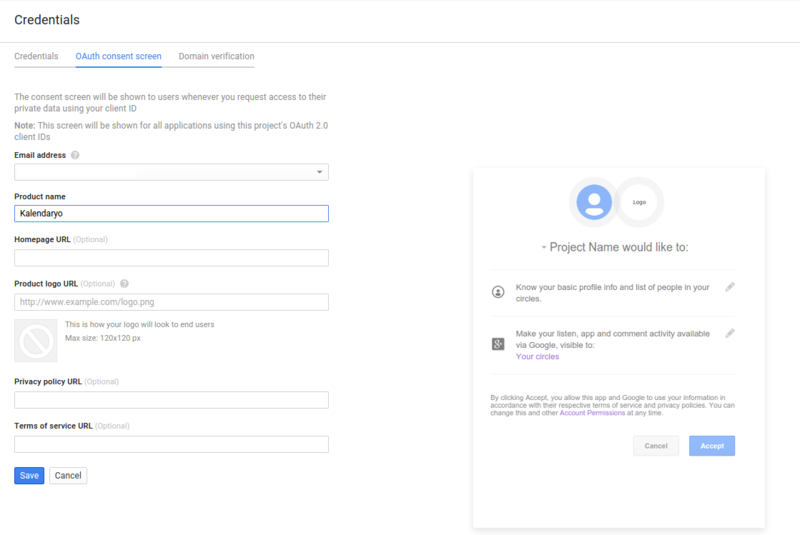 The first thing that you need to do is to create a new project in the Google Developers Console. Once the project is created, click on the enable and manage APIs link on the dashboard. 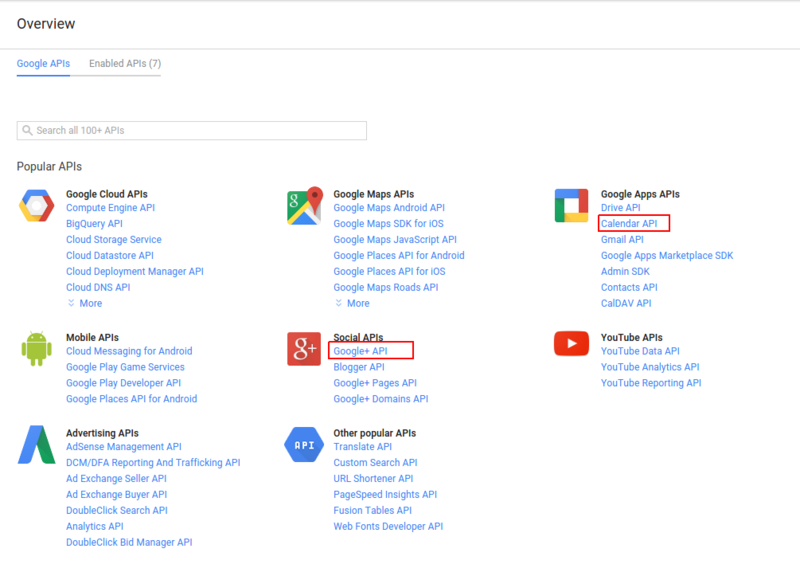 On the google APIs page, select and enable the Calendar API and Google+ API. 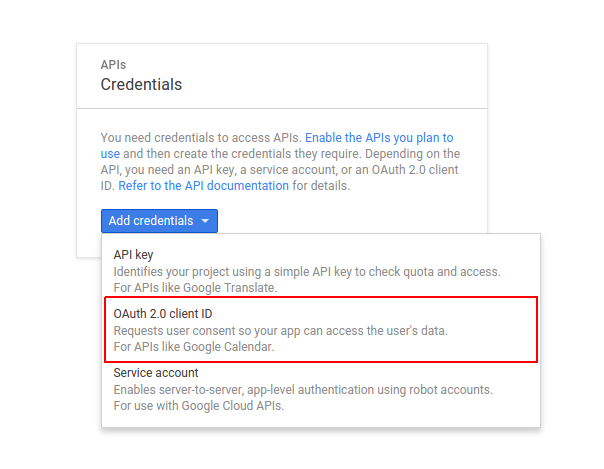 Once enabled, go back to the Google APIs page and click the Credentials link, then the add credentials button and select OAuth 2.0 client ID. This will ask you to configure the consent screen. Click the configure consent screen to do so. Select your preferred email address, add the product name, then click save. We’ll use Laravel via Composer. This will create a new folder named kalendaryo which will serve as your project’s directory. You will be using the Google Client for talking with the Google+ API for the sign in process, and the Google Calendar API for working with Google Calendar. The configuration values that you need to add are DB_DATABASE, DB_USERNAME, DB_PASSWORD, APP_TIMEZONE, GOOGLE_CLIENT_ID, GOOGLE_CLIENT_SECRET, and GOOGLE_REDIRECT_URL. For APP_TIMEZONE, you can use any value from the PHP timezones page. For the database details, create a new MySQL database and use the database name as value for DB_DATABASE. DB_USERNAME and DB_PASSWORD are the login credentials for that database. If on Homestead Improved, you can just use the pre-created DB homestead with the credentials homestead / secret. For the Google config, replace the value for the GOOGLE_CLIENT_ID, GOOGLE_CLIENT_SECRET and GOOGLE_REDIRECT_URL with the credentials that you got from Google console earlier. GOOGLE_SCOPES are the permissions that your app is going to need. What you put in there will show up in the consent screen. The user has to agree in order for the app to have access to the specific data that you’re asking for. If you’re wondering where I got those, you can check out oauthplayground and select the Google+ API and Google Calendar API. The URLs that show up in the dropdown are basically the permissions. email and profile are just shorthand for https://www.googleapis.com/auth/userinfo.email and https://www.googleapis.com/auth/userinfo.profile. Each permission is separated by a comma because you will be converting it into an array later on. In the above code, you set the client ID, client secret, redirect URL, scopes (permissions), approval prompt and access type. You are loading all those values from the .env file that you created earlier. Once everything is set, return the new instance. Later on, you’ll just call the client method to initialize the Google client. In the above code, you’re using a custom route middleware called admin. You’ll be creating it shortly. Using middleware in a route group means that it’s going to be activated for every route in the group. Inside the callback function, you have the different routes that belong to the group. They’re all self-explanatory. The route that respond to POST requests are used to perform write operations, while GET routes are read-only. As mentioned earlier, route middlewares is used to execute code when a specific route is accessed. In the case of the admin middleware, it is used to check whether or not a user is currently logged in. Most route middleware has one thing in common: they have a handle method used for handling the request. This is executed before any method for responding to a route. Inside the method, you check if a user has been set in the current session. If it has, proceed with processing the request. Otherwise, redirect the user to the home page and pass on a message to the session saying that they need to login. The app uses three tables: user, calendar and event. To save time, you can just grab the migrations from the repository, and paste them into the same path in your own project. Execute php artisan migrate in the root of your project to actually create the tables in the database. After that, copy the contents of User.php, Calendar.php, and Event.php into the app directory. These files are the models that you will use later on to talk to the database. Breaking down the code above, you have the index method which returns the login view. In the above template, picnic CSS is used to beautify things. The stylesheets are stored under the public/assets directory. Install it manually or with something nice like BowerPHP. The part which has @yield('content') is where the login form is shown. Going back to the HomeController, next is the login method. Type-hinting is used so that you can use the service container for the Google client. The same is done with the User model. 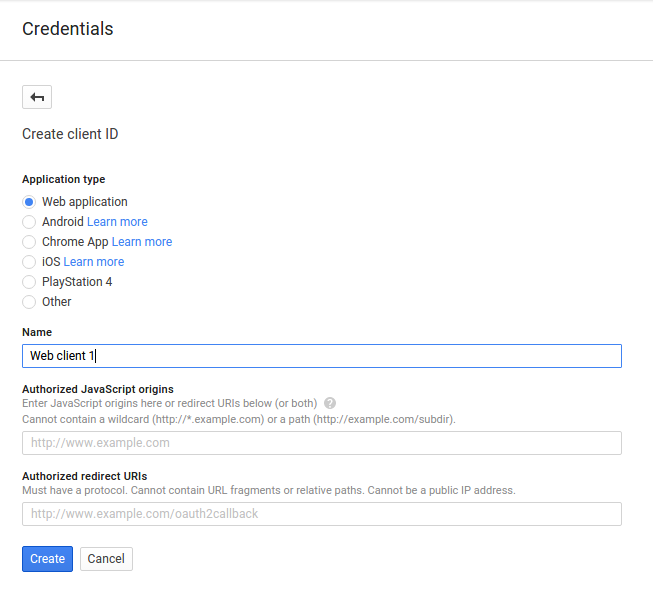 Inside the login method, create a new instance of the Google client, then check if a code is passed in as a query parameter to the URL. If you haven’t implemented OAuth in any of your projects before, the way it works is that the user has to click a link which leads to the login page of the service. In this case, it’s Google, so the user is redirected to Google’s login page. Once logged in, the user is asked for specific permissions. Once the user agrees, they are redirected back to the website with a unique code in the URL. This is then used to acquire an access token which can be used by the app to perform requests to the API. If the user doesn’t exist, create a new user and save the entry to the database. Also create the default calendar for the user. This is the primary calendar in Google calendar. You’re basically making a copy so that the events (appointments) will have a container once you begin syncing the data from the Google calendar service. Let’s break down the above code. Inside the controller, the $client variable stores the reference to the new Google client that you initialized in the constructor. This way, you don’t need to initialize it every time you need it. The index method returns the admin dashboard (resources/views/admin/dashboard.blade.php) view. In the above code, you’re yielding a few templates aside from the main content. These templates are passed in from different views. It simply returns nothing if a view hasn’t defined the section that it’s yielding. The create calendar view contains a form which asks for the title of the calendar. There’s also a hidden field used for preventing CSRF (Cross-site Request Forgery). Once the form is submitted, the doCreateCalendar method is called. Inside the method, validate if there’s a value supplied to the title field and if it has a minimum of 4 characters. Next comes the method that returns the view for creating a new event. Here you’re passing in the calendars that the user has already created because the user has to pick which calendar to add the event to. The admin.create_event (resources/views/admin/create_event.blade.php) view includes jQuery, handlebars and the jQuery datetimepicker styles and scripts. You’re using jQuery to listen for events in the DOM, handlebars for creating new HTML and the jQuery datetimepicker to turn the date fields into date and time pickers. Inside the form, you have a field for entering the title of the event, selecting the calendar in which to add the event, the start and end date and time, and the fields for entering the attendee’s name and email. Below the form, you have the handlebars template for the attendee row. This row would be appended to the attendees container (<div id="attendees">...</div>). In the template above, you’re also including the create_event.js file. This file is responsible for making the date fields into datetime pickers and also listening for the blur event on the attendee email text field. Once the blur event is fired and the attendee name and email for that row are filled by the user, it will generate a new row in which the user can enter another attendee. Set the start and end datetime. Note that the Google Calendar API expects the date and time to be formatted as an atom string so you’re using the toAtomString() method provided by Carbon to format the $start_datetime and $end_datetime. Loop through each of them and if the user has entered both name and email, create a new event attendee in Google calendar and set their email and name. Then, push the created attendee to the $attendees array. Next is the function that would return the view for syncing the calendar (resources/views/admin/sync_calendar.blade.php). Here you pass in the calendars created by the user as the data for this view. Below is the code for the admin.sync_calendar view. This allows the user to select which calendar to sync. What this does once submitted is add any events which haven’t been added to the database, delete cancelled events, and update the updated ones since the last sync. Create a new instance of the Google calendar service and get the calendar based on its ID. Also get the timezone of the Calendar. This allows you to set in which timezone the dates and times of the events are expressed. This way, you can easily convert to the timezone used by the app. Get the IDs of the events that belong to the calendar selected by the user. This will be used for checking if a specific event has already been added before. From there, you can determine what to do with the event. If it’s already in the database and the status is not cancelled, then it requires an update, otherwise delete it from the database. If it’s not yet in the database then it requires adding. Specify a default filter for first sync. The showDeleted option allows you to return the deleted events and the timeMin option allows you to specify the minimum datetime to be used in the request. This way, past events wouldn’t get returned. The Google Calendar sync works by making use of a sync token which changes every time a change is made to the calendar (e.g. an event is added). This token then needs to be saved in the database, so that when the token in Google’s server is the same as the token that you have, it means that nothing has changed. If it’s different, that’s the only time that you perform an update. After the update, the token also needs to be updated in the database. If the sync token is not empty, use that instead of the default filters. This allows you to return only those events that have been updated or added. Next is an infinite loop which will only stop executing once you have fetched all the updates for the calendar that the user has selected. If the event is not cancelled, extract the start and end datetime of the event and convert it to the timezone of the app. After looping through the events, get the token for the next page. Note that this isn’t the same as the sync token from earlier. The page token is used solely for pagination. Here you’re just checking if there are any more pages in the current result set. If there are none, it means that you’ve got all the results, so perform a request to get the next sync token and then update the database with that value. At this point, you can exit out of the infinite loop. Finally, there’s the logout method which gets executed once the user clicks on the logout link in the admin dashboard. This deletes all session data and redirects the user back to the home page. That’s it! 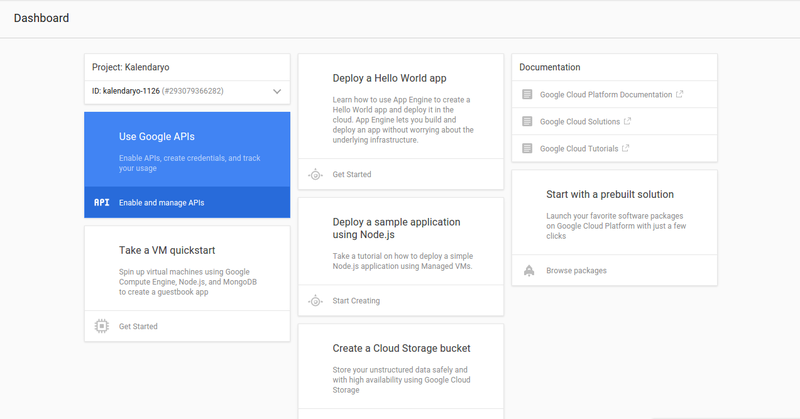 In this tutorial, you’ve taken a look at how to build a PHP app which integrates with the Google Calendar API. By doing so, you’ve learned how to manipulate a Google calendar using PHP. Have you taken advantage of Google’s APIs to build your own calendar app? Were these instruction easy/hard to follow? All feedback is welcome!